Pass through the gates of the Magic Kingdom and become immersed in a world of Pirates and Princesses. Begin by picking up your "treasure map" and "treasure bag" to choose your course. As you embark on your quest for beads and chocolate treasures, you are witness to a special Pirate and Princess parade and fireworks spectacular. Experience Pirate Coves and Princess Courts filled with treasures and specially themed entertainment. Plus, you can enjoy character greetings, a stage show and some of the most popular Magic Kingdom attractions. Please Note: 2009 dates are currently canceled. Event participation is not included with regular Theme Park admission. A separate ticket is required. Tickets are valid for entry only during the event time (listed above) for the date purchased. As event nights often sell out in advance, purchasing tickets at the earliest possible date is highly recommended. Specially priced tickets MUST be purchased in ADVANCE and are not available on-site or on the day of the event. Special "Dinner Add-On" is available at The Liberty Tree Tavern (menu) & Tony's Town Square (menu). To purchase tickets call (407) W-DISNEY (934-7639). The below details are from last season's event. Features a new 39-foot-long raucous pirate ship overflowing with swashbuckling adventurers, plus a treasure-filled float with Captain Jack Sparrow himself. The colorful cavalcade moves down Main Street, U.S.A. with members of a flag corps each twirling the Jolly Roger, plus royal knights on horseback, court dancers and a regal processional of Disney princesses and princes. A fireworks display orchestrated to an original musical score, will fill the sky above Magic Kingdom. 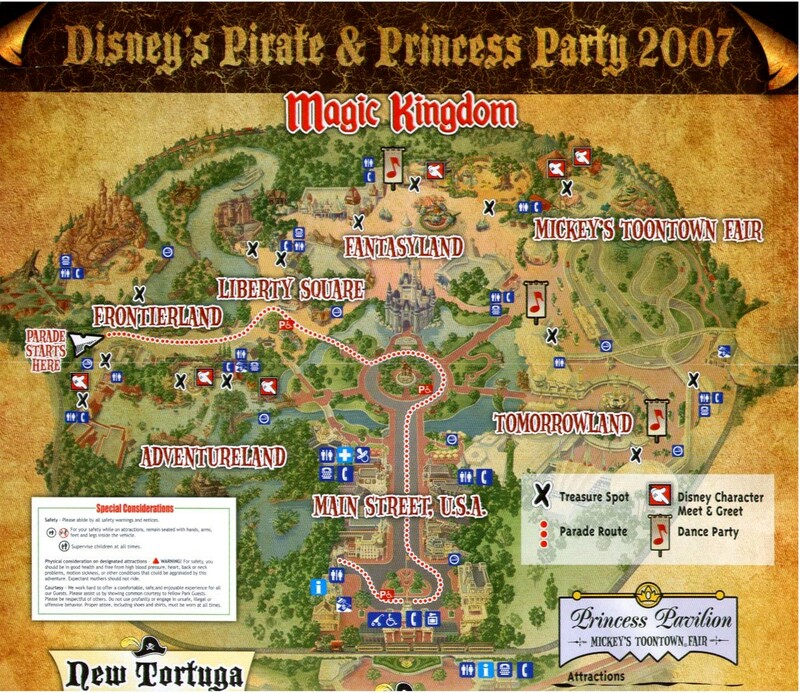 Search for treasure spots throughout all of the Pirate Coves and Princess Courts. Captain Jack Sparrow is looking for a few good pirates to become members of his crew! They'll shiver your timbers with music and laughs. Party with DJ Shelldon and the latest grooves - Sebastian style! Music fit for royal ears. Learn the finer skills of proper princess protection. Jasmine's royal tumblers are leaps and bounds above the rest. Set sail on the Liberty Belle Riverboat with the ghost of Jolly Roger at the helm. They'll steal your heart with a song. High Rollers serenade you Dixieland style. Space pirate Eddie Eclipse and his dance party is out of this world! Lilo, Stitch, Chip and Dale join DJ Edie Eclipse to dance the night away. Check out these break-dancers from beyond. Have a private audience with a Disney Princess. Avast mateys! There be games here!